Mobile virtual network operator (MVNO) is an entity which provides cellular services by using the existing infrastructure of any other mobile network operator (MNO). MVNO has its own data and voice plans, cost structure, and customer handling system. MVNOs provide low cost services to consumers. In addition, operators earn money through the rented spectrum used by MVNOs. Governing bodies are encouraging MVNOs to reduce the expenditure on household communications and promote efficient usage of the full spectrum. MVNOs provide customized services to consumers which are tailor-made to the requirements of consumers. The number of MVNOs is rising globally due to the support of governments and increased competition in the mobile network market. The global MVNO market was valued at US$ 47,090.1 Mn in 2017 and is forecast to grow at a CAGR of 8.6% from 2018 to 2026 reaching a value of US$ 98,438.4 Mn by 2026. Customers using the services of MVNOs are indirectly utilizing the operator’s network. Customer acquisition has become easier and cheaper for network operators as promotional costs have reduced with the help of MVNOs. MVNOs have their own customer service system helping in building a strong relationship with the customers. 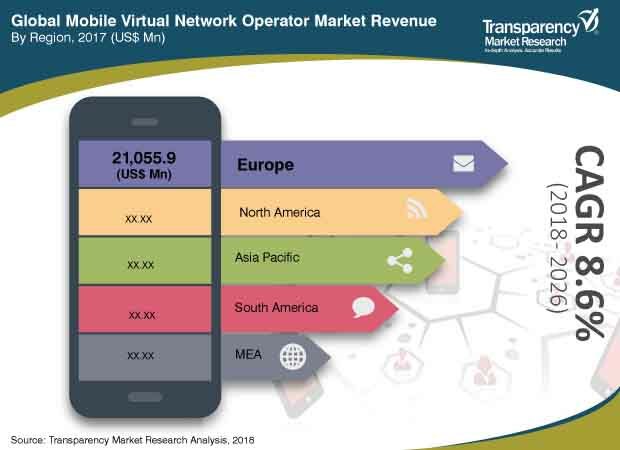 The global mobile virtual network operator market has been segmented on the basis of operational model, type, subscriber, and geography. On the basis of operational model, the market is segmented into reseller MVNO, service operator MVNO, and full MVNO. Mature markets in the mobile phone service segment are likely to experience a decline in terms of number of MVNOs launched. In contrast, fast developing markets are trying to accommodate MVNOs much earlier into their mobile network system which will result in increased number of MVNOs launched. Based on type, the market is classified into discount, telecom, migrant, M2M, business, retail, media, and roaming. Discount was the largest segment of the MVNO market in 2017. Customers are trying to gain low cost calling services provided by the discount MVNOs. Migrant MVNOs are gaining popularity through customized services provided to communities from the same ethnicity. M2M is considered the most promising type of MVNO due to high traction being gained by connectivity of machines and devices. The global mobile virtual network operator market is largely driven by product launches and partnerships. For instance, in January 2017, Virgin Mobile renewed its five-year deal with BT’s EE Limited to provide wholesale mobile services. Under this partnership, EE Limited is projected to offer wholesale mobile network services to Virgin Mobile for an unrevealed price. In December 2017, Virgin Mobile announced the launch of ‘Recommend’ in Dubai to help customers get more value from their mobile plans. Key players profiled in the report include AT&T Inc., Lycamobile Group, Sprint Corporation, T-Mobile AG, Verizon Communications Inc., CITIC Telecom International Holding Limited, Telefonica S.A., Tracfone Wireless, Inc., Truphone Limited, and Virgin Mobile.